BLEND: 60% Cabernet-Sauvignon – 40% Merlot. MANUAL HARVEST: Selection of grapes from identified plots of deep gravel soils, average vine age of 22. Manual harvesting in small boxes between freshness and peak ripeness. • De-stemming and maceration on the skins for 4 hours, gentle pressing (pneumatic horizontal press). • Transfer to vats, racking of the must in cold conditions, and alcoholic fermentation in vats. • Maturing for 4 months in 1-wine barrels with light stirring on the lees (twice a month). French-oak lightly toasted barrels. BOTTLED AT THE CHÂTEAU: 15th February 2017. Production: 2,200 bottles. BLEND : 55% Cabernet-Sauvignon, 40% Merlot, 5% Petit Verdot and 70% Sauvignon blanc and 30% Sémillon. BLEND: 50% Cabernet-Sauvignon – 50% Merlot. vine age of 16. Manual harvesting in small boxes between freshness and peak ripeness. • Maturing for 4 months in 1-wine barrels with light stirring on the lees (twice a month). BOTTLED AT THE CHÂTEAU: 12th February 2015. Production: 1,800 bottles. PROPRIETORS: Familles Mau and Dirkzwager. BLEND: 45% Cabernet-Sauvignon – 45% Merlot – 10% Petit Verdot. BOTTLED AT THE CHÂTEAU: 11th February 2015. Production: 2,100 bottles. BLEND: 50% Cabernet-Sauvignon – 50% Merlot . BOTTLED AT THE CHÂTEAU: 13th February 2014. CHATEAU BROWN ROSÉ, produced for the first time in 2012, is an elegant combination of red-wine varieties (Cabernet Sauvignon in particular) and expertise in making white wines, in French oak barrels with maturing on the fine lees. The robe is pale and elegant with bright tints. The aromatic expression is delicate, marked by citrus aromas, grapefruit zest and acacia blossom. It boasts nice complexity when aerated, as strawberry and pomegranate scents are revealed. The palate is rich and voluptuous. This gastronomic rosé will be ideal served with the most refined dishes. 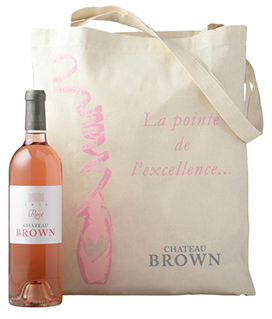 The quality of Château Brown’s first ever pink lends weight to estate manager Jean-Christophe Mau’s belief that Bordeaux has the ability to produce high-end rosés to rival those made in Provence. Oak-aged rosé is not an easy style to get right, but this works (…) It is an impressive first rosé from Château Brown. And, yes, so it should be at this price. A very pretty rosé (…) vinified in barrels for 6 months, just like the estate’s white wines. The only one of its kind in Bordeaux and well worth discovering right away. Its lovely colour somewhere between flesh and raspberry leads into a deliciously appetising bouquet, with scents ranging from cherry to toffee apple and raspberry. The mildly-textured palate rolls out a handful of spices. It is only too rare to find a Bordeaux rosé that stands the test, but this one really stands out – which is why we selected it despite its price. The palate is very characterful for a rosé – loads of flavour range, lovely texture, good persistence. (…)Very accomplished.